For your next trade show, bring an Embrace™ pop-up display in your arms. With so many size options available an exhibit area can have an outstanding table top display or a stunning backdrop. The end cap options on the Embrace Pop up displays provide a sleek silhouette, hiding hardware and framework from view. Portability, set up and dismantling doesn't get any better than with Embrace™. 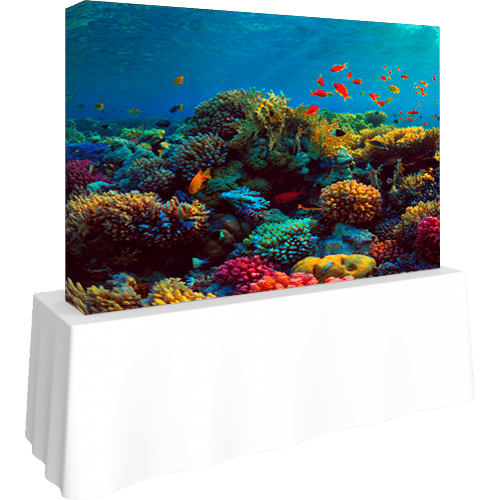 There is also an Embrace™ portable counter available that perfectly pairs with a table top Embrace™ display and compliments your Embrace™ pop up displays or backdrops . Laminated counter finishes are available in black, mahogany, natural or silver to perfectly match any exhibit booth's design and color scheme. Embrace Pop Up Displays use aerospace aluminum grade accordion frames, providing sturdy construction and a counter surface that can handle 50 lbs. The counter also features a concealed shelf that provides a handy storage space for company literature, snacks and drinks, and any of those necessary supplies that are toted to trade shows. Stand the frame on end. Push the "bead" of the fabric graphic into the groove. The Embrace is a fabric pop up display that uses a silicone bead on the graphic to hold it to the frame. The Standard Kits come with frame and graphic and soft carry bag. They can be combined to create unique configurations, and are also available with back-lighting (see below). A brand new feature for a familiar and reliable display! Now, the increasingly-popular Embrace Display has a backlit option. Users can retrofit their existing frames with back lighting, or purchase these all-inclusive kits below. Create an immediate impact with your audience by having a stunning display that is literally glowing. build a 20 ft wide booth. build a 30 ft wide booth. Amplify your appearance by adding a seamless look through the space with some Embrace Accessories. Click image above to magnify. Embrace™ is already establishing a winning reputation. What are actual trade show people saying about the new Embrace™? They are calling it the complete package. What rave reviews are really homing in on are the unique features that set this design apart as superior to others. They like the durable framework and vibrant graphics. Improved connection rods create a more secure connection to hubs. The high quality of the Embrace™ Tension Fabric Pop-Up Display surpasses the framework of competitors for strength and quality. That is why there is a lifetime manufacturer warranty for the frame that gives customers full protection against any manufacturing defect. The creators of this modern display believe in their product. But rave reviews don't stop there. The printing use for the graphics is simply superb. Dye sub Injection directly into the fabric creates an image that can withstand the abuse of long-term use. The opaque nature of the fabric further enhances the contrast of graphics, text or images. For a display whose brilliancy will endure just as much use as its rugged framework, Embrace™ has got the winning combination. It's easy to deliver an Embrace™ pop-up display to your destination. Carry or wheeled bags are available. Although the displays are light enough to tote yourself or wheel behind you, shipping kits are available to make it more convenient for those who need to travel long distance for shows. But the lightweight design means savings on shipping costs. Another plus reviewers prefer. Embrace™ Pop Up Displays utilize "push fit" silicon edge tension fabric graphics and feature contemporary styling with pop-up convenience. Lightweight, portable and modern... That's the winning combination in an exhibit display that is completely customizable. SEG fabric graph﻿﻿﻿﻿﻿﻿ics create sleek, sophisticated styling. Stretch fabric and collapsible framework deliver the advantages of a large display, making maximum impact, yet easy setup by one person.